Now, a bit about these images. 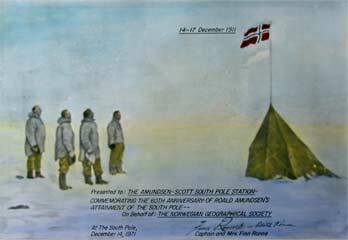 The one at left appears in Amundsen's account The South Pole. The erection of this small spare tent (more on the tent itself) was one of the final bits of business before the party headed back to Framheim. 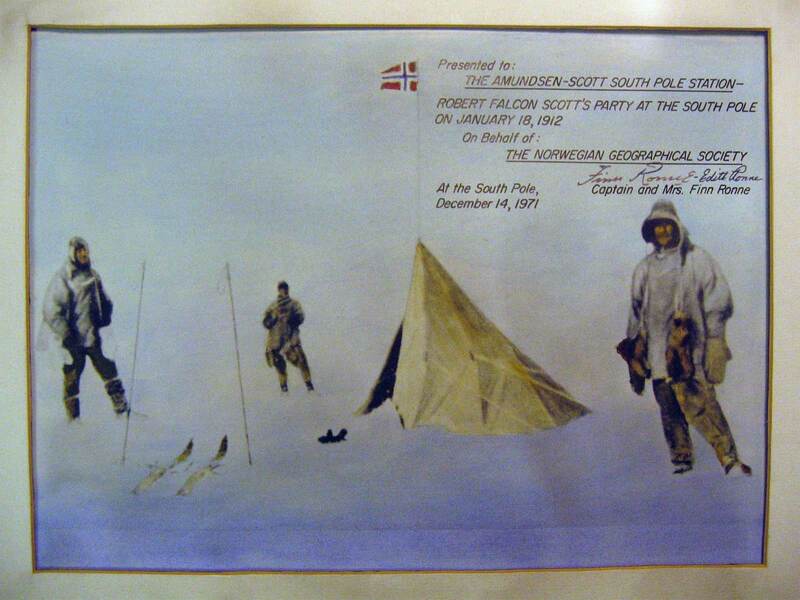 Inside they left some spare equipment and a letter to King Haakon (with a cover letter addressed to Scott). They then tied the tent door flaps securely. Finally in this scene, they bared their heads and solemnly said their farewell. The photographer is Olav Bjaaland (who had the only working camera); from left: Amundsen, Hanssen, Hassel and Wisting. 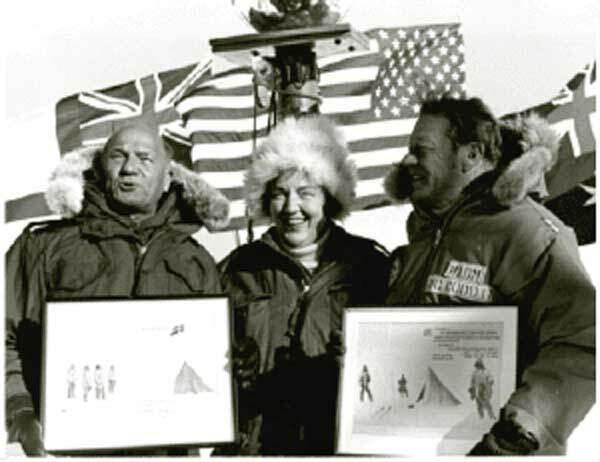 The photo at right shows disconsolate members of Scott's team in front of the same tent; from left: Scott, Bowers, Wilson, and Evans. 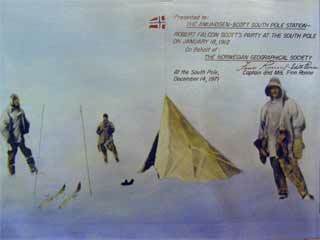 This photo was recovered from the sledges left at the site of the party's demise. Credits...the picture of Jackie and Finn Ronne is from the Ronne archives, courtesy of Karen Ronne Tupek, who has this excellent web site, with many more photos and stories of the family exploits. 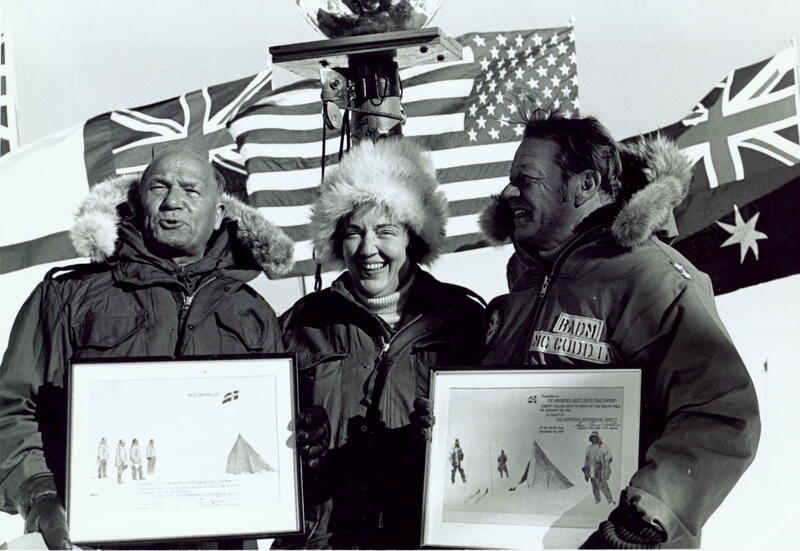 The photo of Jackie and Finn is from this page And in my role as the unofficial official South Pole historian, I must also mention that she has books and a CD available, including Jackie's autobiography--have a look, these are worth reading. 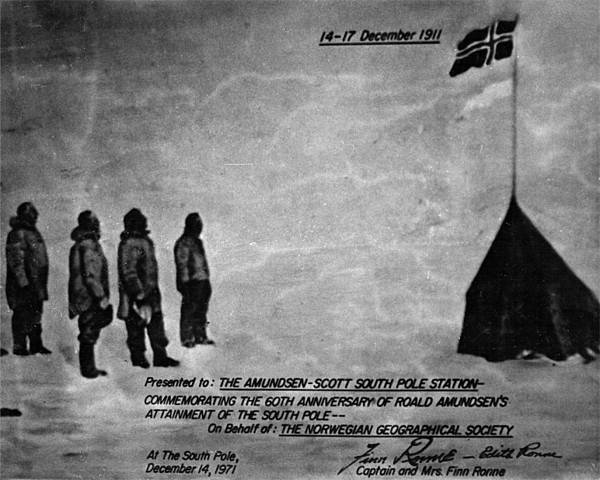 The closeups of the two photos were taken at Pole--the Amundsen photograph at left is from 2007 manager Andy Martinez who reframed it (I couldn't find it on station in 2005, here's the 1977 version from the Pole Souls collection), and I took the Scott shot while at Pole in 2005.